My team and I have been continuing our research on state regulations and how practices can efficiently set up membership programs for their dental practices. During our research we have found a beneficial strategy called “DPC law” (Direct Primary Care) where a practice can simply create a “medical retainer agreement” – See template below (May vary in different states) which will allow your practice to bypass any insurance regulations in most states. This gives me and my team hope as our goal is to help as many dental practices as we can create, organize, grow and automate an in-house membership program. 3. text that clearly prohibits the health care provider from billing an insurer for the services delivered under the agreement (i.e. the membership program). “State Sen. Pat Colbeck, R-Canton, believes the path to providing Michigan citizens with access to higher quality, lower cost health care has been cleared following Gov. Rick Snyder’s signature into law of Colbeck’s SB 1033 (Public Act 522 of 2014). According to dpcare.org, Direct Primary Care (DPC) is an innovative alternative payment model improving access to high functioning healthcare with a simple, flat, affordable membership fee. No fee-for-service payments. No third party billing. The defining element of DPC is an enduring and trusting relationship between a patient and his or her primary care provider. Patients have extraordinary access to a physician of their choice, often for as little as $25 – $70 per month, and physicians are accountable first and foremost for their patients. DPC is embraced by health policymakers on the left and right and creates happy patients and happy doctors all over the country! Is Direct Primary Care legal? Yes, DPC is “not insurance” (since there is no risk transfer), and legal DPC contracts can be drafted in every state. As of Aug. 16, 2016, 17 states have passed laws related to direct primary care. 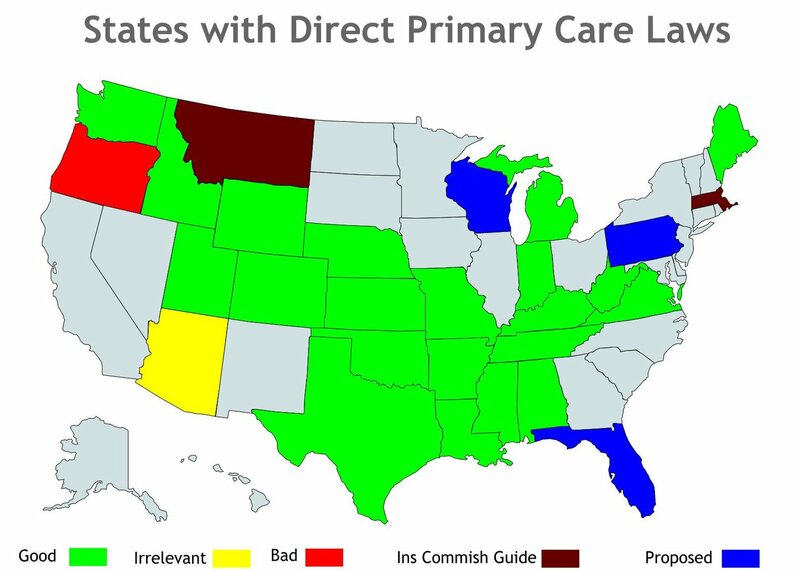 (See “Direct primary care laws by state.”) Most of the state legislation is motivated by a desire to define DPC as “not insurance” so that the state insurance commissioner does not feel obligated to prohibit or regulate the practice model. DPC is arguably legal in every state without this legislation, but legislation is often helpful because it clears up legal gray areas and thus removes barriers to physician adoption of the model. Defining DPC in no way restricts your freedom to contract with a patient in any way you like. You could intentionally change the contract to NOT be defined as DPC if this suits your interests more. Definitions are needed when there is a gray area in the law – you either get there via legislation – legislation that DPC Frontier can help author and shape – or via a judicial decision – an area of uncertainty that most physicians fear. A definition of DPC in each state = lower legal barriers to entry = less uncertainty = wider adoption of DPC. This is a snapshot of the states that currently support DPC laws. The links below will take to specific states and help you understand what you need to do to be compliant and to not be seen as an insurance provider. My team and I will continue doing our research to help the dental industry win the battle with dental insurance. We are currently talking to attorneys in states across the nation to help us understand what practices need to do to set up a successful and compliant membership program. We will be creating a podcast series on The Navigating Dental Insurance Podcast (SaynoToPPOs.com) specifically talking with attorneys about this law and how dental practices can leverage this law to create recurring revenue and give patients a better quality care. We also will be posting more information and resources to help your practice on our website! If you are interested in starting an in-house membership program. Schedule a demo with our team today and we will guide you on what you need to do to make this work for your practice. **This article is not intended to serve as legal advice. We recommend you speak with your attorney or legal counsel to see how DPC and a Medical Retainer Agreement can benefit your medical or dental practice.